We offer this series, which covers many of the occasions on which a printed card is suitable, for those prefer the elegant and restrained. Each thought is minimally stated, and is enclosed in a delicate design. 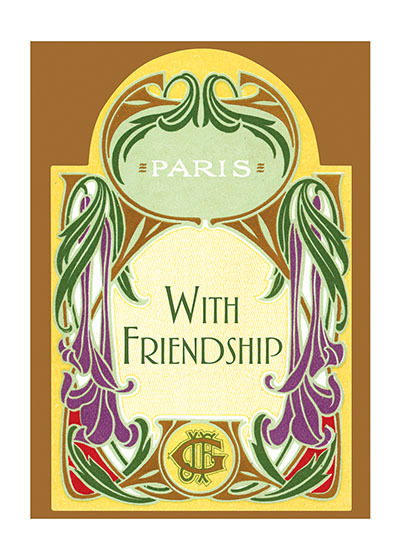 The designs we use here are all taken from the labels of French beauty products. Here, as in many areas of decoration, the French triumph. Imagine that you are wandering adventurously through the backstreets of Paris. You chance upon a little card shop, a carterie, and there find cards of such quiet loveliness that you can't resist buying a number to take home. These are the cards you discovered.